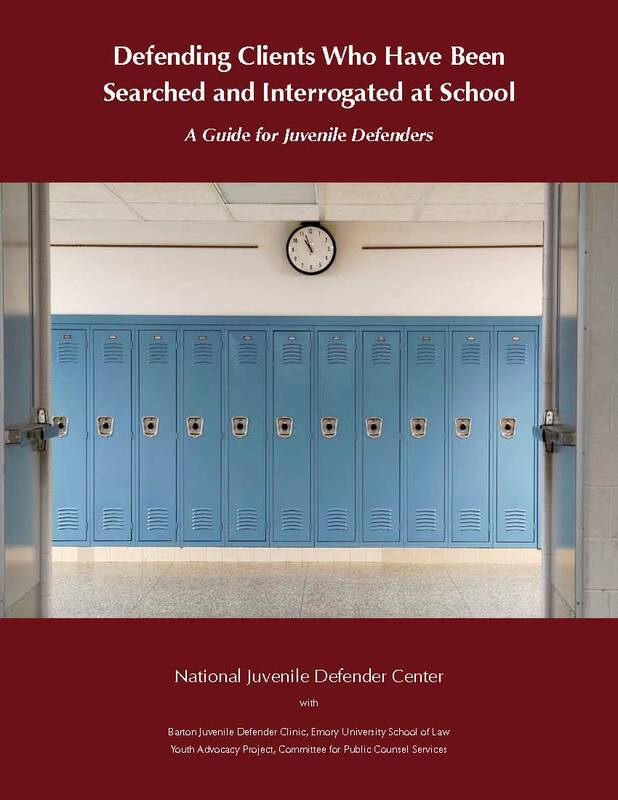 The National Juvenile Defender Center (NJDC) produces reports, training guides, and practice-focused fact sheets to provide juvenile defenders with timely, useful information. Most of these materials are available below as PDF files. To receive hard copies, request additional information, be added to our mailing list, or arrange a related training session, please email NJDC or call us at 202-452-0010. NJDC produces and distributes fact sheets on various topics to provide useful information and practical strategies to juvenile defenders. 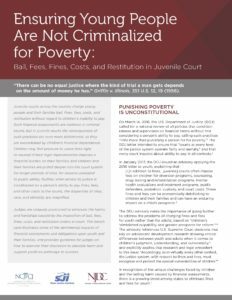 Recent fact sheets have focused on the harms of detention, increasing juvenile appeals, youth and family engagement, access to counsel, and the fragmented state of juvenile defense systems across the country. NJDC also produces and distributes Issue Briefs that are intended to provide a national snapshot of a particular juvenile defense issue and to highlight innovative approaches from around the country addressing that issue and pushing for reform. 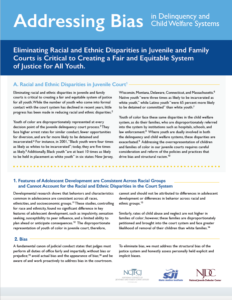 In partnership with the National Council of Juvenile and Family Court Judges (NCJFCJ), NJDC has created Addressing Bias in Delinquency and Child Welfare Systems, a bench card emphasizing that “eliminating racial and ethnic disparities in juvenile and family courts is critical to creating a fair and equitable system of justice for all youth.”The Addressing Bias bench card educates juvenile and family court judges about structural, explicit, and implicit bias; provides judges with self-reflection tools to help them recognize and prevent bias in their courtroom; and offers judges concrete strategies to correct implicit bias. The Standards represent a comprehensive understanding of the role and duties of the juvenile defender in the 21st century juvenile court system, and seek to strengthen and guide the ethical and professional performance of the juvenile defense attorney. The Standards present a national approach to systematizing zealous, competent, and diligent defense practice in juvenile court and set out a framework for representation that is anchored in the law, science, and professional codes of responsibility. This policy paper describes the critical and specialized role of the juvenile defender and reflects best practices as defined by the field—front-line defenders, social workers, academics, and other juvenile justice advocates working in our nation’s juvenile delinquency courts every day. The goal of the piece is to educate judges, prosecutors, probation officers, and other juvenile justice professionals about the importance of the juvenile defender’s responsibility to advocate for the client’s expressed interests. 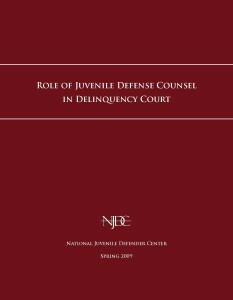 Adopted in partnership with the American Council of Chief Defenders in December 2004 and revised and reissued in July 2008, these Core Principles provide criteria by which a public defense delivery system may provide high quality delinquency representation and fully implement the holding of In re Gault. In partnership with the National Council of Juvenile and Family Court Judges (NCJFCJ), NJDC has released this information card for judges in juvenile courts. Judges are uniquely positioned to eliminate the harms and hardships caused by the imposition of bail, fees, fines, costs, and restitution orders in court. This bench card illustrates some of the detrimental impacts of financial assessments and obligations upon youth and their families, and provides guidance for judges on how to exercise their discretion to alleviate harm and support youth on pathways to success. 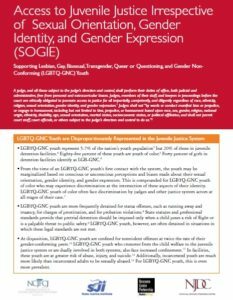 In partnership with the National Council of Juvenile and Family Court Judges (NCJFCJ), we released “Access to Juvenile Justice Irrespective of Sexual Orientation, Gender Identity, and Expression (SOGIE),” an information card to promote judicial leadership in supporting Lesbian, Gay, Bisexual, Transgender, Queer or Questioning, and Gender Non-Conforming (LGBTQ-GNC) Youth. 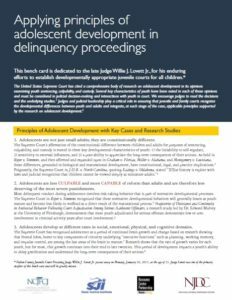 In partnership with the National Council of Juvenile and Family Court Judges (NCJFCJ), we released “Applying Principles of Adolescent Development in Delinquency Proceedings,” an information card to promote judicial leadership in recognizing the developmental differences between youth and adults and integrate, at each stage of the case, applicable principles supported by the research on adolescent development. 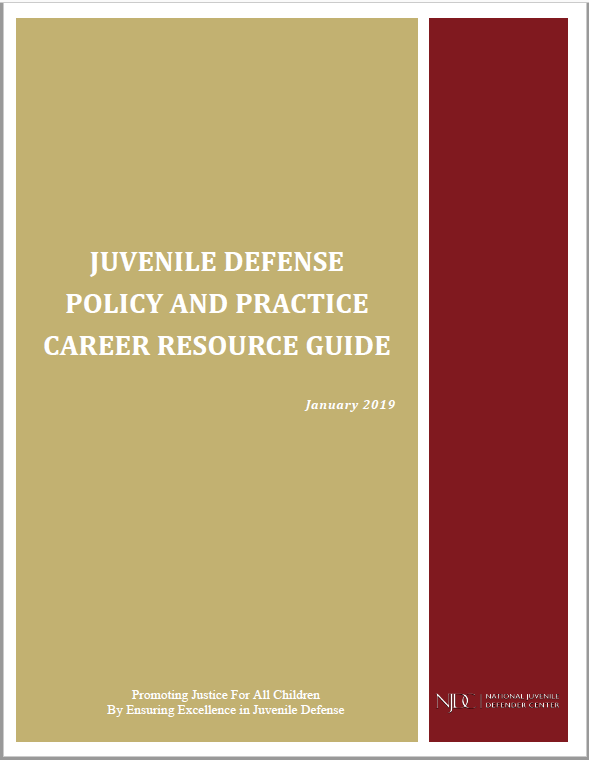 NDJC has created this electronic guide to raise the profile of juvenile-specific defense as a career. It is intended for law students interested in pursuing juvenile defense as a career and includes information for on coursework and externships that will help strengthen a candidate’s application in the juvenile defense field; resources to guide in the search for juvenile defense jobs, fellowships, and funding opportunities; and a list of offices around the country that provide employment and internship opportunities specific to juvenile defense. Probation is the most common disposition for youth who are adjudicated in juvenile court. Yet the scope, language, and form of many probation orders make it difficult for youth to succeed while on probation, despite the fact that probation agencies are focused on achieving positive youth development and accountability. 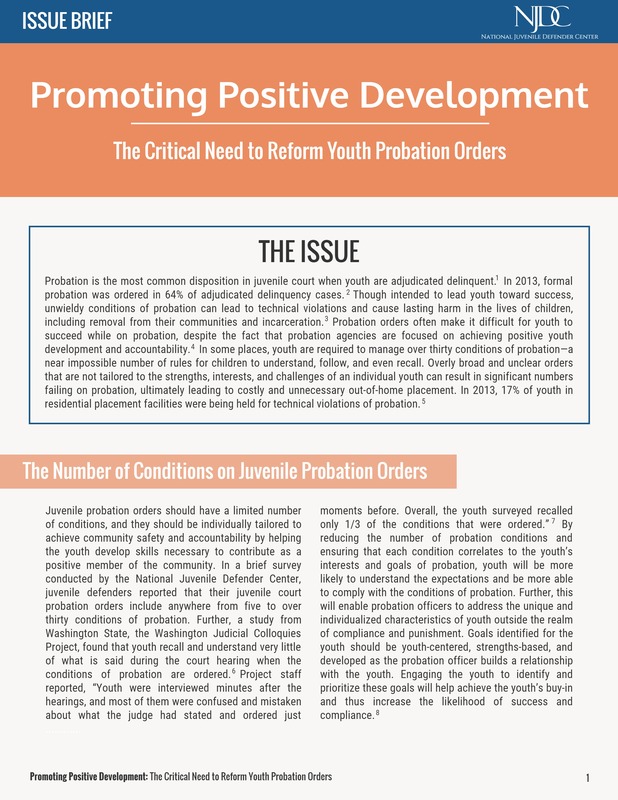 This brief outlines the importance of reforming juvenile probation orders so that they are developmentally appropriate, achievable, and individualize in a way to increase positive youth outcomes. 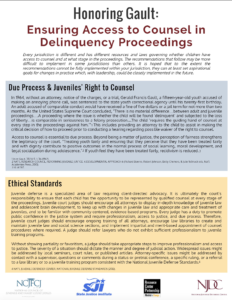 In partnership with the National Council of Juvenile and Family Court Judges (NCJFCJ), we released “Honoring Gault: Ensuring Access to Counsel in Delinquency Proceedings,” an information card to promote judicial leadership in fulfilling children’s constitutional right to representation in juvenile court. 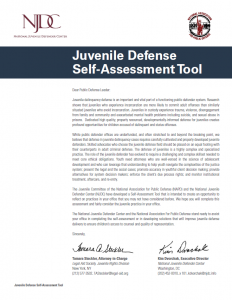 The Juvenile Committee of the National Association for Public Defense (NAPD) and NJDC developed a Juvenile Defense Self-Assessment Tool that is intended to create an opportunity to reflect on practices in public defender offices pertaining to the defense of juveniles in delinquency proceedings. While public defender offices are underfunded, and often stretched to and beyond the breaking point, NAPD and NJDC believe that defense in juvenile delinquency cases requires carefully cultivated and properly developed juvenile defenders. When a child is involved in the juvenile court system, it can be a stressful time, not only for the child, but also for the child’s family. While the child gets an attorney to represent his or her legal interests, that attorney does not—and legally cannot—work for the entire family. 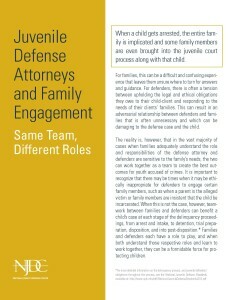 But that does not mean that families and defense attorneys need to be at odds. In fact, there are many ways that the child’s defense attorney can help the family understand the system and teach family members how to be great advocates for their children. Working together, defenders and families can often be a powerful force for children. The Diagnostic and Statistical Manual of Mental Disorders (DSM) is a classification manual for mental health professionals with itemized criteria for diagnosis disorders. Children and adolescents in juvenile court are often assessed and evaluated by mental health workers and the resulting diagnoses are provided to the court. These diagnoses often drive many of the decisions the court and other stakeholders make. The fifth revision of the DSM was released in 2013. 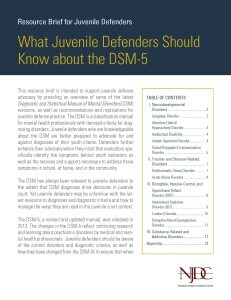 This briefing paper provides juvenile defenders with details on some of the latest revisions to the DSM-5 as well as how diagnoses might be used in the case. Defenders need to understand the diagnoses their youth clients are receiving in order to assure appropriate outcomes for their clients. As delinquency courts across the country handle an increasing number of referrals from schools, juvenile defenders often defend clients who have been searched or interrogated on campus. This guide provides a general overview of the law governing school searches and interrogations and practice tips for keeping out evidence obtained in violation of clients’s rights. Because case law varies from state to state, and some state constitutions provide broader protections than the federal constitution, it is critical that you research the law in your jurisdiction. 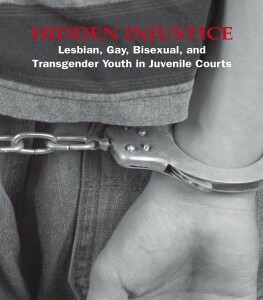 Hidden Injustice represents the first effort to examine the experiences of LGBT youth in juvenile courts across the country. 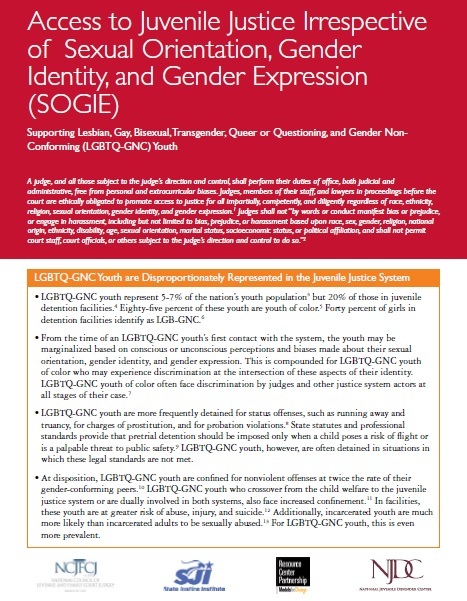 The report is based on information collected from 414 surveys and 65 interviews with juvenile justice professionals, including judges, defense attorneys, prosecutors, probation officers, detention staff, and other juvenile justice advocates; focus groups and interviews of 55 youth who possess relevant firsthand experience; and an extensive review of relevant social science and legal research findings. The lack of interdisciplinary advocacy services for juveniles limits children’s ability to access needed—and often legally mandated—social and educational services and increases the likelihood of repeated encounters with the delinquency and criminal justice system, thereby jeopardizing public safety, wasting tax dollars, and most importantly failing our youth. 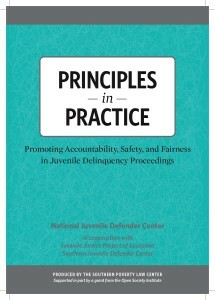 Woefully under-resourced indigent defender systems often provide deficient representation to juveniles in delinquency court, Principles in Practice identifies ten components that should underlie all juvenile indigent defense systems and demonstrates them in action. This guide to detention advocacy, published with a grant from the Annie E. Casey Foundation, describes how best to keep juvenile clients out of detention at the early stages of delinquency proceedings. 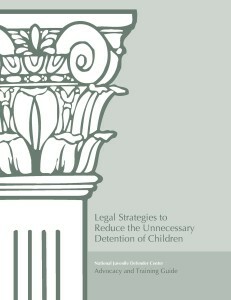 The guide presents specific strategies for representing youth at detention hearings, for advocacy outside the courtroom, and includes research explaining the harmful effects of detention. 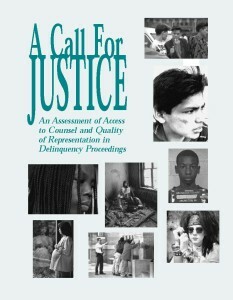 A national assessment of access to counsel and quality of representation in juvenile delinquency proceedings, A Call for Justice was the precursor to NJDC’s state assessments. Although the report found some excellent work being done, it largely uncovered widespread evidence that juveniles are, in general, poorly represented across the country. The report examines the causes of inadequate representation and makes recommendations to juvenile defenders, state and local bar associations, state legislatures, law schools, juvenile courts, and others to improve the quality of representation for children facing delinquency proceedings.